The earliest known reference to banking in Billericay is a banknote dated 27th October 1808. This surviving banknote is for one pound and was issued by Crisp & Butler, Billericay Bank; its decoration includes Britannia standing with a shield and lion at her feet. This Billericay Bank drew on their London agents, Norris, Butler & Co., 31 Addle Street, presumably a family connection, and is listed in the Annual Post Office Directory for 1809 only. 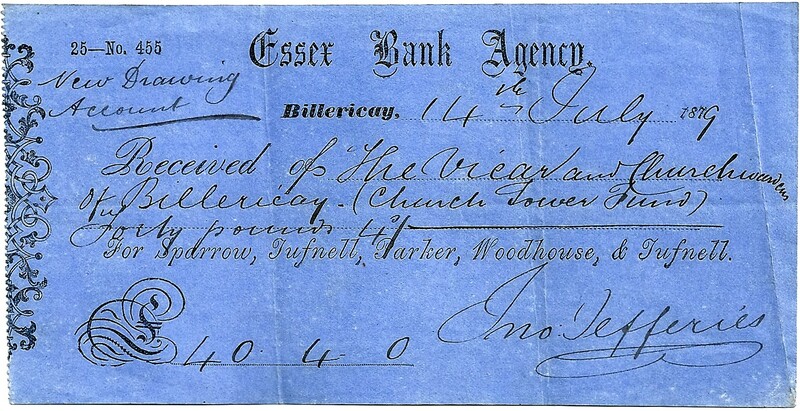 After 1809 the next recorded bank in Billericay was Harvey, Son & Co. Rochford Hundred & Billericay Bank. This bank is reputed to have been founded in Rochford towards the end of the 18th century. Matthew Bernard Harvey and his son John Whittle Harvey the active partner used Ramsbottoms as their London agents. The exact date of the opening of the Billericay Office is not known, but it existed by 1812. As a result of J.W. Harvey’s mismanagement this Bank failed in July 1814. Both partners were made bankrupt, with genuine regret that the respected elderly father should find himself in such a position. His friends, including some of the Bank’s creditors, used some ingenious devices to ensure that he should not go penniless. An offshoot of Fincham & Co., the Epping & Ongar Bank, formed by Benjamin Fincham, Thomas Barrell, William Fincham and Benjamin Fincham junior were the next firm to set up a bank in Billericay. Their version of the Billericay Bank opening by August 1814, Barrell being the resident partner in Billericay. 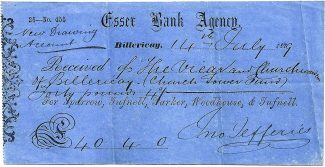 The Epping & Ongar Bank failed on the 8th April 1816, presumably bankrupting the Billericay Bank branch of the business in the process, leaving the town without a bank for several years. Following the demise of the Epping and Ongar Bank, in 1816, the town appears not to have had a bank until 1823. In this year, Sparrow, Brown, Hanbury, Savill and Simpson, The Essex Bank of Chelmsford and Braintree opened a branch in Billericay. This new branch was served from its Chelmsford operation, but it was short-lived, as a result of the financial crisis of 1825/26, which lead to the failure of one of the Chelmsford banks. Sparrow & Co., as the Billericay bank was known, thought if prudent to retract their business and closed several branches, including Billericay. So, once again the town was without a bank, this time for a period of thirty years until 1857. Sparrow, Tufnell & Co., The Essex Bank, as they had become known, then appointed Henry Collin as their agent in Billericay. Collin, a solicitor and Commissioner for oaths, the partner in Colin & Williams, of Billericay and Grays Thurrock, was also clerk to the justices, Union clerk, district auditor, superintendent registrar and agent for the Essex & Suffolk Insurance. In 1868 his clerk John Jefferies, who held the post until 1896 when this bank became part of Barclay & Company Limited, succeeded him in the Bank agency. Barclays’ kept Jefferies as their Billericay agent until he died in 1921. By this time he had been in charge of the bank in Billericay for 53 years. R H Rust was appointed the first manager in 1921, following Jefferies’ death. Sub-branches were opened in Wickford and Laindon; both eventually became full branches of Barclays Bank PLC. Barclay’s bank in Billericay became part of the Brentwood group of branches, effectively making it a sub-branch once again. It is now over 200 years since the first bank opened in Billericay. Throughout most of this time there appears to have only one bank operating here, since, it was not until 2nd February 1953 that Lloyds Bank opened a sub-branch, served from Brentwood. Based on an article by Arthur Norman Harrison of Saffron Walden dated May 1954, with 1984 and 2015 revisions.